With the 2018 CrossFit Games taking place only 30 miles away at the Alliant Energy Center in Madison, Wisconsin, Fort Atkinson-based Jones Dairy Farm took the opportunity to sample No Sugar, Certified Paleo Sausage, Canadian Bacon and Bacon to the more than 70,000 CrossFit athletes, coaches and spectators that attended the five-day competition from August 1-5, 2018. More than 100 companies and organizations took part in the CrossFit Games Vendor Pavilion that boasted 100,000 square feet of food and beverage sampling, CrossFit approved apparel and equipment, live demonstrations, and more. 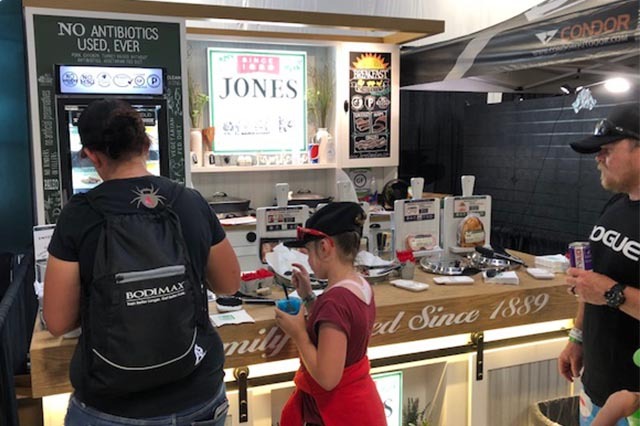 Taking full advantage of the venue and health conscious audience, Jones sampled products that are highly sought after by the CrossFit community. Items included All Natural Uncured No Sugar Bacon and Antibiotic Free, No Sugar All Natural Breakfast Sausage and Canadian Bacon, products that remain true to original Jones family recipes and have gained the certification of the Paleo Foundation. Jones Certified Paleo All Natural Uncured No Sugar Bacon and Antibiotic Free, No Sugar Sausage and Canadian Bacon are currently available in select retailers nationwide. Visit www.JonesDairyFarm.com for more information and to access the company’s product locator.